In reality, the grocer is a discount version of Whole Foods. Sprouts is majority owned and controlled by Leon Black’s Apollo – a $140 billion private equity firm. The founders, executives and employees of Sprouts appear to own only 5% of the company, having sold out to Apollo in the context of an earlier acquisition/expansion. Apollo will likely boost executives’ stake by offering a slug of options yoked to the eventual sale of the company (post IPO) or some performance metric. Investors in the IPO face a majority/controlling financial investor whose lock up period for stock sales will end 180 days after the company's IPO. The company’s slogan is, “Healthy Living For Less!” – and is also one of the company’s three trademarks. The company’s store format and value proposition appeal to a wide demographic; and against the backdrop of greater interest in eating healthy and “natural” foods, this means rapid sales growth. People are willing to spend money on organic foods, says a June 2012 report on “The New Luxury” from research firm IBISWorld. Natural and organic food spending far outpaces the growth rate in traditional US supermarkets, a $600 billion industry growing at 1%. In contrast, natural and organic experienced a 12% CAGR from 1997 to 2011 reaching $43 billion and is anticipated to grow by 10% per year through 2020, according to company filings and industry reports. In its short ten-year life, Sprouts has grown to become the second largest specialty retailer of natural and organic foods in the country. The grocer recently was named # 1 on a list of 100 “hot” retailers (ranked by sales growth) from Stores Media, the publishing arm of the National Retail Federation. However, its 157 stores is small compared to Whole Foods’ 350 stores. In fact, Whole Foods is now the 8th largest food and drug retailer in the US. In terms of sales, Whole Foods is 6.5x larger than Spouts reflecting a far greater efficacy in sales per square foot backed by a powerful brand strongly identified with natural and organic. What is the word “natural” in the context of American food and food products? According to the FDA, “natural” has no actual definition as applied to food products; yet the USDA says meat, poultry and egg products labeled as natural must be minimally processed and contain no artificial ingredients. The “natural” label does not include any standards regarding farm practices, and there are no standards or regulations for the labeling of natural food products that do not contain meat or eggs. In another twist, a court ruled in what appears to be an arbitrary manner. In Ries v. AriZona Beverages USA LLC, No. 3:10-cv-01139-RS, Docket Entry 195 (N.D. Cal. Mar. 28, 2013), the Court found that the plaintiffs failed to produce any evidence that high fructose corn syrup (HFCS) and citric acid are artificial and therefore the defendant could use the words “all natural” for products containing these ingredients. Given their size, both Whole Foods and Sprouts inevitably must source their products from the same third-party suppliers that have the distribution footprint to support a national chain. In fact, United Natural Foods (UNFI) is Whole Foods’ #1 supplier and is #2 to Sprouts. The two competitors are selling essentially the same thing and in many cases that same thing is subject to interpretation and context – the key difference is price. The winner may be determined by how much risk each grocer takes with its brand strategy to win mindshare in the natural and organic space. Under stress, value-oriented brands tend to hold up; when skies are clear, aspirational brands do best and command superior pricing power – as is illustrated by Whole Foods’ recent rebound. 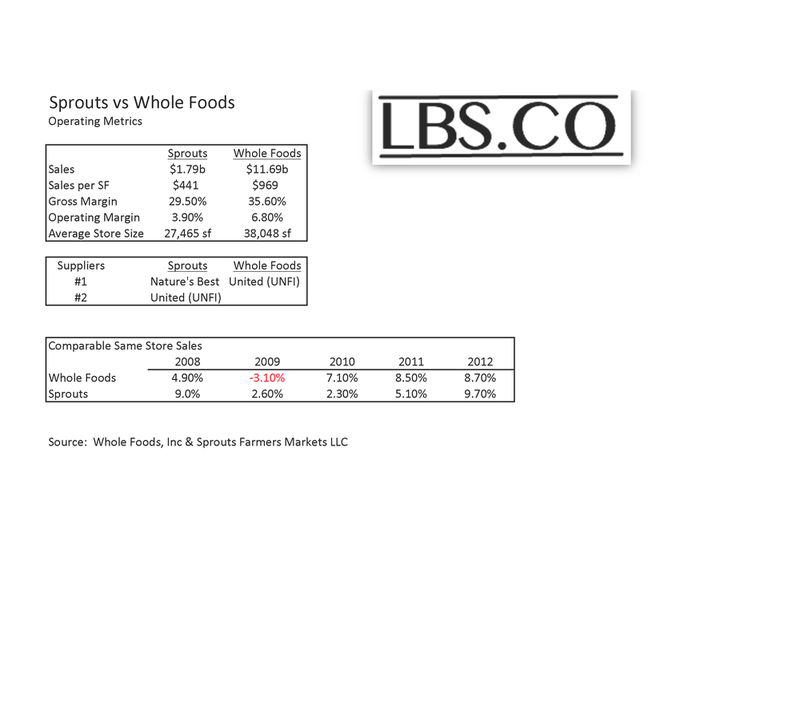 During the economic downturn, Whole Foods’ same store sales actually declined while Sprouts experienced only a modest decline in growth. Regardless of economic conditions, grocery brands face harsh penalties for negative press related to food provenance. Tesco, the UK’s largest grocer, experienced a crisis (and a decline in sales and market share) over a horsemeat scandal that erupted 6 months ago. Tesco has since spent a great deal of time and money repairing its brand. After all, consumer perceptions are defined as much by price as by definitions and perception. Sprouts IPO sets up a showdown over perceptions of “natural” and “organic” and the value consumers assign to these labels. As these two companies ride the organic and natural wave, brand perception and economic conditions will prove up a winner – and in the process alter the meaning of natural and organic.